There are more than 10,000 pachinko parlors in Japan. parlors that can be seen everywhere. What is pachinko all about? How does it work? Surely, many visitors have asked such a question. P-ARK offers a ‘PACHINKO CLASS’ where you can learn about the history and the content of Pachinko. And of course! How to play PACHINKO! ”Fun for life, to make everyday living more fun” is the credo of our company. fun of the Japanese unique Entertainment 'PACHINKO'. 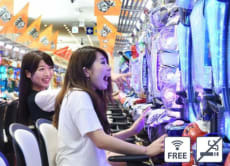 Try the Japanese entertainment “Pachinko” in Tokyo! This is really a 2,000 yen explanation and a 1,000 yen pachinko experience. But pachinko is very complicated and you are going to be very thankful you have the knowledge if you want to play. I learned here and taught my other friends how to play - I'd recommend you do the same. After continuously looking at others play pachinko we decided to learn the game through voyagin. We were provided a location for meetup and our teacher Jhena greeted us with enthusiasm which was welcoming. We introduced each other and had a small chat while we walked towards our training location which is like a 5 minute walk or less. Our training location had a few machines that simulated the actual pachinkos. It looked slightly intimidating but Jhena assured us it was pretty easy to learn and it was. Her explanation was on point and never did we feel like it was overwhelming or discouraging. She provided us tips and tricks which helped immensely (I hit the jackpot at the actual machines). I recommend going through this experience to have a better understanding of the game and have a greater experience. Also if you have a chance ask for Jhena who provided an amazing and informative experience.